What are worm castings? Worm castings are an organic form of fertilizer produced from earthworms. Also known as vermicast, worm castings manure is essentially earthworm waste, otherwise known as worm poo. As these creatures eat through compost, their waste creates an optimal soil enricher. Worm castings resemble football-shaped particles that improve soil aeration and drainage, as well as increase water retention in the soil. Can You Use Worm Castings for Plants? Yes you can! Organic worm castings are excellent for plants. They contain all the essential nutrients that plants need in addition to enriching the soil in which the plants are grown. Not only can this fertilizer be used on nearly any type of plant, it can also be used directly on plants without burning them. Worm castings manure can be applied as top dressing, side dressing, or worked into the soil. Adding worm castings manure to the soil aerates and improves its overall structure while providing beneficial nutrients to plants. They are also effective for repelling many pests that feed on plants, such as aphids and spider mites. Worm castings are the richest natural fertilizer known to humans. That's right: as little as a tablespoon of pure worm castings provides enough organic plant nutrients to feed a 6" potted plant for more than two months. Worm castings stimulate plant growth more than any other natural product on the market. Unlike animal manure and artificial fertilizers it is absorbed easily and immediately by plants. But Worm Castings don't only stimulate plant growth: they also enhance the ability of your soil to retain water (because of its texture), and it even inhibits root diseases such as root rot. All Organic, All Natural, made locally with Red wigglers! Great for Flowers, Vegetables, plants and, so much more! A little goes a long way! Can be used as plant food! 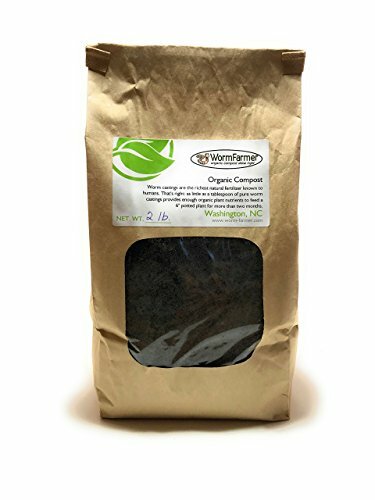 If you have any questions about this product by WormFarmer Organic Compost, contact us by completing and submitting the form below. If you are looking for a specif part number, please include it with your message.